Despite moving to the country, I’ve spent the last month getting up at 4am to commute into London, to work out my notice period at my old job. In the brief moments I’ve snatched at my new home, I’ve been chasing the clock trying to start on house renovations, and begin various garden projects. Needless to say, I’ve had little time to achieve anything. And there have also been other infuriating challenges swallowing up my precious time. Last Monday, my van broke down en route to London, leaving me stranded on the freezing motorway in the early morning, waiting for roadside recovery, and asking the Gods what I’d done to deserve such a thing! Our Instagram account, which I try to update daily with snapshots of blooms, vegetables and other treasures from nature, has ground to a halt. Tweeting is practically non-existent. And with my old allotment some one hundred and thirty miles away, I haven’t had my regular therapy of sinking my hands into the soil for weeks. My foundations have been rocked, leaving me somewhat unsettled. I’ve been in bit of a haze, not really knowing if I’m coming or going. To be brutally honest, I’m bloody knackered! However, as of this weekend I have finally put all that behind me. I’ve said goodbye to my old career, and can now begin my new life in Suffolk, properly. My new garden has a large shed decaying in a corner. It’s also surrounded by overgrown trees. So, I need to take out before I can put in. This week, I’m hoping to dismantle the shed, start pruning the trees and clearing the bottom of the garden where there’s a lot of wasted space. Once that’s done, the garden should feel lighter and roomier, and I’ll have my blank canvas ready to go. But while I’m thrilled that tomorrow I can start creating my dream, the demons are at play; laying on the guilt, teasing me, wrestling with my conscience. I’m now self-employed so I need to find work and earn money. Soph will be the first to tell you about the two monkeys that have always hung from my back. Firstly, I’ve never been one to sit still. It’s not natural to me, as soon as I get any downtime, I feel guilty, like I should be doing something. Although this may seem trivial, it really has become a burden to me over the years. The guilt really weighs me down. No matter how hard I may have worked, this demon is only too keen to raise its head. I haven’t had a break in a year, and the next few weeks are meant to be a bit of a holiday for me, a chance for me to recoup and re-energize myself, as I make a gentle start our new garden. But no matter how much I focus on the dream, I know the guilt will soon set in. My second demon is money. I’ve never been driven by financial gain, but we all need a certain amount to get by, and with the monolith of self-employment ahead, I’m not afraid to say, I’m a little nervous. I’ve been self-employed before, and managed. But this time around it feels like there’s more at stake. I’m older, wiser and know what I want from life. But there’s two of us plus our diva of a cat now, and I don’t want to let anyone down! But there is a determination in me, a true grit that edges me forward. I’ve never been one to follow the crowd, or play by the rules, and I’m excited by the challenges ahead. 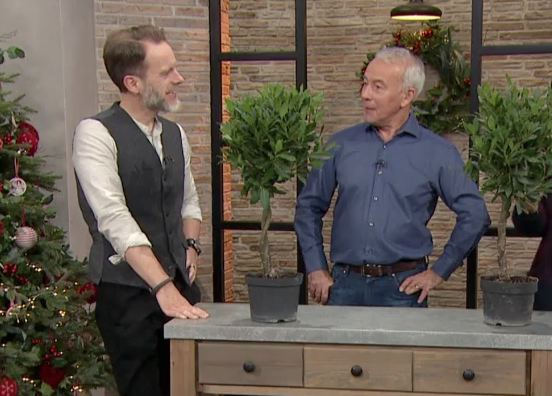 Only a few hours ago, I was in a live television studio presenting on QVC’s Richard Jackson’s Gardeners’ Gifts with gardening guru Richard Jackson, talking Suttons bay trees and apples… so I must be doing something right! I love television presenting, so I cross my fingers there’ll be more of that to come in 2019! But there will be moments when I hit the wrong chord, or seem a little lost in the limelight, so please don’t be quick to ‘boo’ me off-stage. Like every journey into the unknown, it’s going to be both thrilling and nerve-racking… but I can’t wait. Next Burgon & Ball Christmas Giveaway! I love this piece. So open, brave, and from the heart, and I wish you every success, together with lots of happiness, in your new adventure. You both deserve it! Gads! To ‘me’ it sounds dreadful. The way you describe sounds . . . well . . . dreadful, but in a more realistic way. I hope to be doing something similar, but opposite, next summer. I am already dreading it. It will be a fantastic journey. I retired theee years ago tomorrow. Making the decision was difficult but once made I haven’t looked back. I retired early and worried about money. But you cut your cost according to your cloth as my mother would have said. But it’s exciting and invigorating and an adventure which is what you have embarked on. Take time to enjoy it. Don’t beat yourself up when you have some ‘you ‘ time. It’s important and both of you have fun As well. Go for it Agents. As one who also find it difficult to sit back and do nothing, I can appreciate how you are feeling. Everything will work out for you, take it one step at a time and soon you will find the light at the end of the tunnel. Don’t worry, we won’t desert you and eagerly look forward to sharing your journey. What you are doing is really brave and so many people (including me) wish we had the courage to do the same. You only get one chance, go for it and enjoy the journey together. Adrian, the cat will be fine!. seriously you do need to relax, remember we can actually give more if we rest sometimes, evidently “active rest” suits you best, doing something different. Good luck in your new life and looking forward to hearing about your new garden.